Nigeria earned no points to move up in the latest FIFA rankings released on Thursday despite their busy schedule in the past month. The team remains 52nd in the world, no thanks to playing two unofficial games against Catalonia and Farense in the period under review. 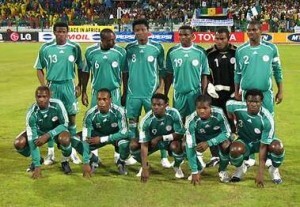 The only official game, against lowly-rated Cape Verde, ended goalless. Nigeria’s group opponents in the Africa Cup of Nations don’t also have it good in the rankings of Fifa. Zambia, who is fifth in the continent, dropped five places to 39th in the rankings. Ethiopia is further down the rankings at 110th with no additional points. Ivory Coast, which defeated Egypt in their AFCON warm-up, are still the best ranked Africa country after an unchanged 14th place on the FIFA ranking. The Black Stars climbed from last year’s 30th place to 26 after garnering 788 points. Algeria, who faces Ivory Coast, Togo and Tunisia in Group D, slipped three places down to 22nd but held.